REDWOOD CITY, CA (August 23, 2018) —In 2017, 81.6% of companies in the Equilar 500 granted performance equity to named executive officers, a slight decrease from 84.6% in 2016, according to a new Equilar report, Equity Compensation Trends, which features commentary from E*TRADE Financial Corporate Services, Inc. Though the prevalence of performance equity decreased from 2016 to 2017, a large majority of companies continued to tie awards to performance metrics. In fact, the target of performance awards granted to CEOs in both 2016 and 2017 made up over 63% of total equity granted to CEOs. The report also revealed that median stock granted decreased by 9.2% from 2016 and 2017, with a median of one million shares in the most recent year. Equilar 500 companies within the utilities sector granted the least amount of stock, with a median of 690,700 shares, followed closely by industrial goods companies at 706,000 shares. 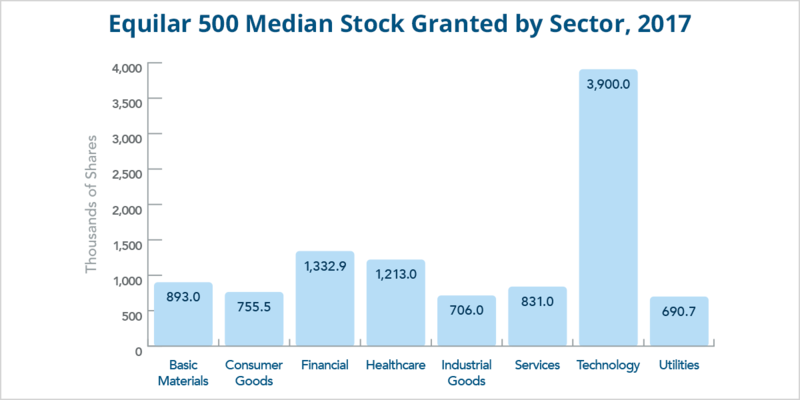 The technology sector granted the most stocks by far, with a median of 3.9 million shares. To request a copy of the full report, click here. Equity Compensation Trends, an Equilar publication, examines equity compensation design and granting practices of Equilar 500 companies over the last five fiscal years. The Equilar 500 tracks the 500 largest public companies, by reported revenue, with headquarters in the U.S. that trade on one of the major U.S. stock exchanges (NYSE, Nasdaq or NYSE MKT (formerly AMEX)), and adjusted to approximate the industry sector mix of similar large-cap indices. Companies that filed a proxy statement (DEF 14A) or disclosed compensation information in an amended 10-K filing (10-K/A) by May 31, 2018 were included in the fiscal 2017 year. Previous years were defined similarly. E*TRADE Financial Corporate Services, Inc. offered independent commentary to provide insight and context based on experience regarding how companies structure equity pay. Equilar is the leading provider of board intelligence solutions. Its data-driven platforms, BoardEdge and Insight, provide tools for board recruiting, business development, executive compensation and shareholder engagement. Companies of all sizes, including 70% of the Fortune 500 and institutional investors representing over $15 trillion in assets, rely on Equilar for their most important boardroom decisions. 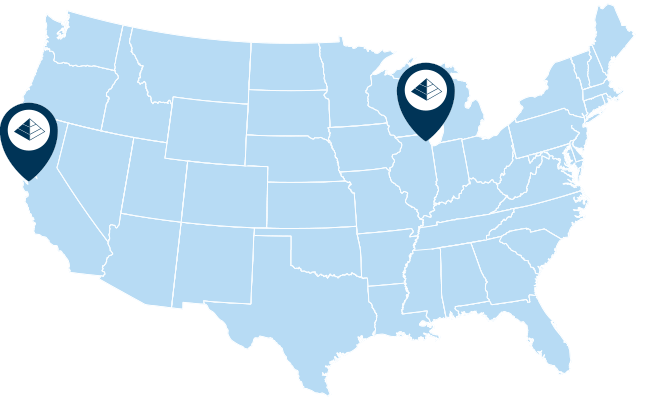 Equilar also hosts industry-leading board education symposiums, conducts comprehensive custom research services and publishes award-winning thought leadership. Founded in 2000, Equilar is cited regularly by Associated Press, Bloomberg, CNBC, The New York Times, The Wall Street Journal and other leading media outlets. Visit www.equilar.com to learn more. About E*TRADE Financial Corporate Services, Inc.
E*TRADE Financial Corporate Services, Inc. (“E*TRADE”) is a premier provider of equity compensation management tools for some of the nation’s top companies, serving 1.6 million+ participants¹. We offer flexible, easy-to-use & powerful solutions for complete equity compensation management, including support for most equity vehicles & seamless access to stock plan participant services/education from E*TRADE Securities. For 6 years running, E*TRADE’s proprietary Equity Edge Online® platform was rated #1 for Loyalty & Overall Satisfaction in Group Five’s Stock Plan Administration Benchmark Study². E*TRADE was also rated highest among partial administration plan sponsors in overall satisfaction for brokerage services in the same study. The data and analysis contained in this publication has been prepared by Equilar. The commentary, where noted, has been provided by E*TRADE Financial Corporate Services, Inc. Equilar is not affiliated with E*TRADE Financial Corporate Services, Inc. or the E*TRADE Financial family of companies. Data collected from the E*TRADE Financial Corporate Services, Inc. Equity Edge Online® platform as of 7/31/18. As of June 30, 2017, Group Five Stock Plan Administration Benchmark Study and Financial Reporting Benchmark Study rated Equity Edge Online® highest in Loyalty and Overall Satisfaction for the 6th consecutive year (2012-2017). E*TRADE was also rated highest among partial administration plan sponsors in overall satisfaction for brokerage services in the same study. Group Five, LLC is not affiliated with E*TRADE Financial Corporate Services, Inc. or the E*TRADE Financial family of companies.